Confession time: I had never seen a film by French director Claude Autant-Lara before this set and frankly had no concept of his reputation beyond the distaste that the critics-turned-filmmakers of the La Nouvelle Vague held for his work. He was the tradition of quality that they rebelled against. A little background on Claude Autant-Lara. He worked in the French film industry for almost twenty years as an art director, costume designer, and director before making Le mariage de Chiffon (1942), his first commercial success as a filmmaker in his own right. That it was made during the German occupation of France (and the French film industry) in World War II makes it all the more intriguing: under the strictures of Germany’s oversight of filmmaking in France, Autant-Lara found a story that passed German censors and appealed to a demoralized French population, and he revealed a style and sensibility that celebrated the French character. 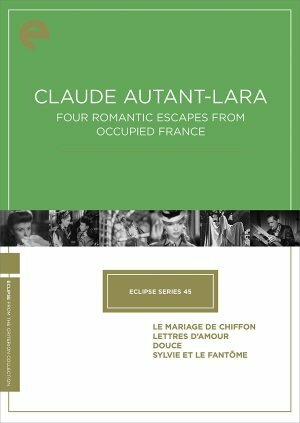 That quality is found in all four films in Claude Autant-Lara: Four Romantic Escapes from Occupied France, a collection of three comedies and one tragic drama all starring Odette Joyeux and set in more innocent times past (historical picture were easier to pass by German censors). Set in turn-of-the-century France, Le mariage de Chiffon stars Joyeux as the 16-year-old Corysande, who prefers the nickname Chiffon, much to the dismay of her society mother who would see her behave like a proper young lady of wealth and position. Chiffon isn’t quite a tomboy but she is much more interested in hanging around the airfield where her beloved Uncle Marc (Jacques Dumesnil), the brother of her stepfather, has devoted his fortune to getting the first airplane in France airborne. Marc is an idealist, called “mad” in the village for his experiments but championed by Chiffon, who dreams as big as Marc does. When Chiffon discovers that the effort has bankrupted him on the eve of his first success, she accepts the marriage proposal of an elderly Colonel (André Luguet), a charming old fellow who is smitten with the young Chiffon from the moment he first sees her searching for a missing shoe in the street.